the college bookstore and business administrator concern over the impact of textbook prices on student performance and persistence. 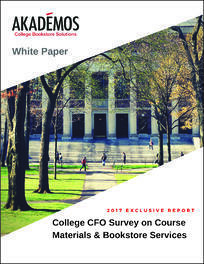 Today, Akademos Inc. announced the release of an exclusive new White Paper that highlights the results of their proprietary 2017 College CFO Survey on Course Materials and Bookstore Services. This comprehensive report provides critical insight on today’s top college and university bookstore trends and includes findings on bookstore sales, textbook affordability, student preparedness, and emerging trends in digital course materials, eLearning models and general merchandise sales. This is the third study surveying CFOs and business administrators in higher institutions across the nation. The previous surveys were conducted in 2013 and 2015. The exclusive 2017 College CFO White Paper provides an instructive look at critical issues higher education institutions face and offers potential solutions for the future that can help your institution lower course material costs and win back your students to the campus bookstore. The full report summarizes responses to all questions asked in the 2017 CFO Survey, provides analysis of the results, and compares trends from the 2013 and 2015 surveys. This White Paper is available at no charge.